When you hear tweed, you probably think of a pipe-smoking Harvard professor circa-1945. 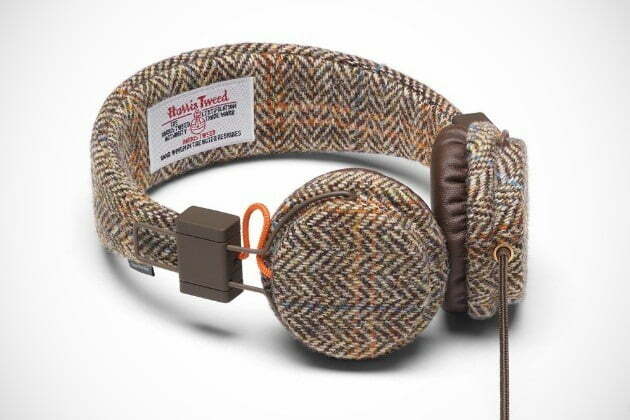 Urbanears’ new Plattan Tweed Edition are anachronistic to be sure, but tweed is about the only thing they have in common with the last century. The funky, ironic phones are equipped with 40 mm handmade drivers, an in-line remote/microphone and a socket on the earpiece so friends can listen in. We’ve evaluated Urbanears’ products before, and we haven’t been blown away, but this model’s selling point is more style than substance. In other words, audio junkies might be left wanting, but hipsters will swoon over the aesthetic. It’s probably safe to say that we don’t have many tweed connoisseurs in the audience, but in case you were curious, their exterior is constructed of hand-woven harris tweed, made of 100 percent virgin wool. These look comfy for the winter, but on a hot summer day, we don’t know that you’d want to rock a woolen headband. The phones – which are the third entry in the Urbanears Editions line – also feature a 3.5mm plug and a collapsible design. They’re available now at urbanears.com for $80. Digital Blend: DLC for all! Halo 4, XCOM, Dishonored! Borderlands Legends revealed!